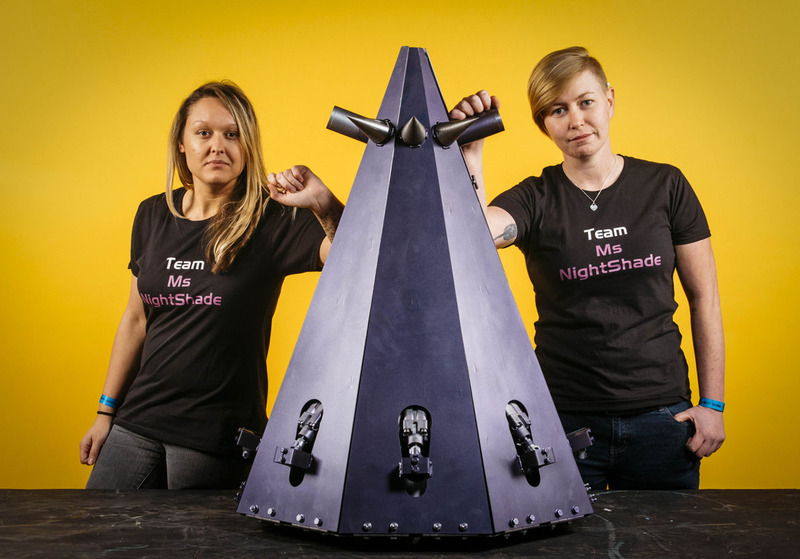 Bio – Nightshade was a robot built by Katie Henderson & Jodie Nye, two students of the University of Brighton. Built as a unique robot design, Nightshade proved to be too light, Apollo was able to flip it up into the air with ease. What made Nightshade Unique? – Her unique pneumatic petals. Power/Drivechain – 24V SLA batteries, Watty ESC and 24V wheelchair motors. Where is the robot now? – Acording to Ian Watts, it was skipped because the universty needed the space. Ian Watts testing Nightshade’s Pneumatics. Damage done to one of the motors had just happened. Romeo Vignali helps assembly while Jodie & Katie are in a exam.